The National Academy of Sciences released a report today on how the California Department of Pesticide Regulation assesses the safety of pesticides. It found that DPR assessments are thorough, but not very timely. It typically takes six to ten years. The report also says DPR needs to create a clearer process for ranking the hazard of pesticides and identifying which pesticides should take priority. Paul Tower with the Pesticide Action Network says the report confirms concerns the group has raised over the years. In a statement, DPR says it’s pleased that the report recognized its risk assessment process is comprehensive, and that its pesticide-exposure assessments are among the most thorough in the world. Environmental justice advocate, pesticide warrior and lifelong Earlimart resident Teresa De Anda is recalled as a “true inspiration” and “tireless leader”. De Anda, 55, passed away last week after battling with liver cancer. The Central Valley advocate who shed a light on the health impacts of pesticide drift leaves behind seven children and eight grandchildren. One of her daughters, Valerie Gorospe, says her mother’s passion will live on through others. Robots may soon be pulling weeds on Central Valley farms. At UC Davis researchers have received $2.7 million dollars from the USDA to study how new technology could replace field labor. Automated devices pick cotton. Machines shake nut trees. But, there are a three tasks for which farmers rely solely on humans. David Slaughter: "These include hand weeding, thinning and harvesting." David Slaughter is the lead researcher working on robotic cultivators. California has announced stringent new rules on a common pesticide used in the production of strawberries, almonds, tomatoes, and peppers. Chloropicrin is a fumigant that is used to treat the soil before crops are planted. The new rules are more stringent than those adopted by the U.S. EPA in 2012. Under the new regulations from the state’s Department of Pesticide Regulation, farmers will be required to provide larger buffer zones when applying the chemical, and will be required to reduce the size of fields where it is applied. Struggling sugar beet farmers in the San Joaquin Valley are turning their crop into energy instead of sweetner. A pilot plant could prove to be good for the environment and the economy. They're called "energy beets." They look like a red table beet but, but they're larger, white, and very high in sucrose. Sugar beets in California date back to the late 1800's. Kaffka: "Beets have been grown here commercially longer than any other place." California's air regulators are increasingly turning their attention to a greenhouse gas that has largely gone overlooked - methane. According to the U.S. EPA, when it comes to climate change, methane emissions have an impact 20 times greater than CO2 emissions, pound for pound. That's why Governor Jerry Brown singled out the gas during his inaugural address this month as part of his plan to combat climate change. 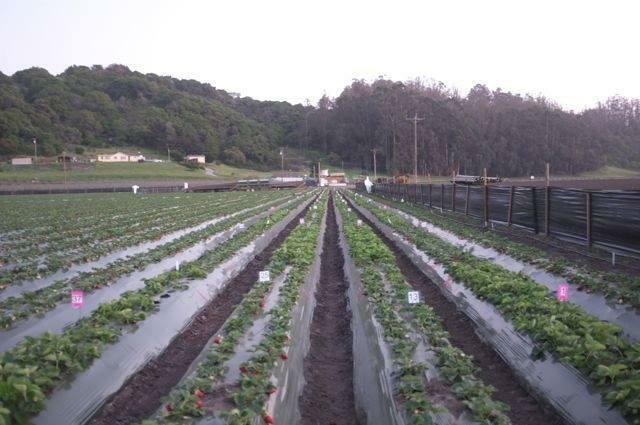 Some environmentalists say hazardous strawberry pesticides should be banned in California by 2020. But as Amy Quinton reports from Sacramento, strawberry growers say finding an alternative to fumigants is difficult. On the steps of the Capitol, farm workers, environmentalists and health leaders called on the state to phase out soil fumigants used most heavily in strawberry production. They say fumigants have a wide range of health effects, are highly volatile, and drift from where they are applied. Martha Arguello is with Physicians for Social Responsibility.